Asiatic lilies, tall and elegant, are one of the great pleasures of the summer garden in Ontario. A diverse group, they include flowers in all shades of white, pink, red and yellow, as well as flowers of different shapes. Their flowers can face up toward the sun, down to the ground or straight out at each other. 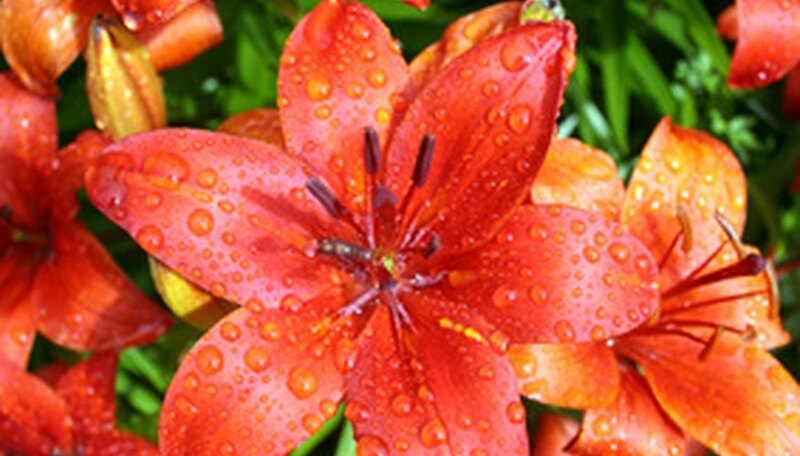 Ontario, with its mild summers and cold winters, provides the perfect environment for growing Asiatic lilies. Order lilies from bulb catalogs in late winter or buy them at garden centers in spring when they become available. Buy the largest bulbs you can afford, as they will reward you with larger, more abundant flowers. Choose a sunny, well-drained site. Improve the planting site by mixing in 1/3 to 1/2 compost to the depth of a shovel. Asiatic lilies require fertile, well-drained soil. You can dig a large hole for several bulbs or several smaller holes for individual bulbs. In either case, plan on giving each bulb 6 inches of space. Dig a hole in the improved area about 5 or 6 inches deep. (When planted, the top of the bulb should be 3 or 4 inches below ground.) Scratch some bone meal or bulb fertilizer into the bottom of the hole according to label directions. Spread out the roots of the bulbs, and place them in the bottom of the hole. Cover the bulbs with the remainder of the improved soil. Water the area thoroughly to settle the soil. Cover the area with 2 inches of mulch. Mulching is particularly important in Toronto and south (zones 6 and 7) to protect the bulbs from summer heat. Water the bulbs thoroughly throughout the first season only when drought threatens to dry out the planting area. Scratch bone meal into the top of the soil every spring to encourage root growth and flower production in the summer. Asiatic lily bulbs are long-lived, but they do need to be divided every three to five years. Simply dig up the bulbs in late summer, break them apart with your hands or split with a shovel blade, and plant each new bulb in its own hole. In the colder regions northwest of Ottawa (zones 2 through 4), cover the bulbs after the first frost with about 2 inches of mulch to protect them from hard freezes. Fall is a great time to plant Asiatic lilies. If you are able to get bulbs in fall, or if you have bulbs left over, go ahead and plant them any time until the ground freezes. When cutting Asiatic lilies, cut no more than one-third of the stem. The remaining stem will continue feeding the bulb. Don't plant Asiatic lilies in wet soils. While rich, the boggy soils near the lakes of Ontario are not suited for these rot-prone bulbs. Consider growing them on higher ground or in raised beds or containers.